“We certainly hope that the Patent Office sticks to the principle that human operation (a la business methods) as opposed to mechanics should not become patentable.”We have no issues with patents on mechanics, however to name a human being as some sort of ingredient is approaching the territory of the laughable. Lawn mowers have existed for a very long time (nearly 200 years according to Wikipedia) and having an operator present on top isn’t entirely novel, either. We certainly hope that the Patent Office sticks to the principle that human operation (a la business methods) as opposed to mechanics should not become patentable. 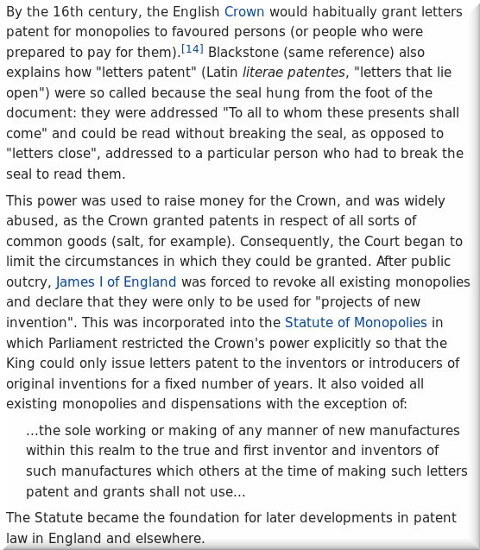 Well, a patent is a government-granted monopoly and not a “property” or an “asset” per se. Artistic wordings that attribute physical properties to ideas are worse than dishonest; that’s how the recording industry paints copying (or sharing) as “piracy” and “theft”. Saying things like “ownership” (or similar, e.g. someone “bought” a patent or “stole” a patent) makes as much sense as “eating” an idea. Is Andy Ramer’s Departure the End of Cantor Fitzgerald’s Patent Trolls-Feeding Operations and Ambitions? Strange then that the UK patents act states “any patent or application for a patent is personal property (without being a thing in action)” don’t you think? The word “property” is overused here (estate also). Even our patent office is called IPO, where two letters stand for things that it isn’t. In the not-so-distant past people too were described as “property”. Didn’t Proudhon cover this issue? “In the book, Proudhon most famously declared that “property is theft”.” https://en.wikipedia.org/wiki/What_Is_Property%3F I thought it was Native Americans who said that.